Back in January I sat across from my good friend Dan Long and listened to him pour out his passion about unleashing his new workout cure to the entire world. We immediately hit it off and built a huge bond because of our mutual beliefs about family, spirituality…and our deep passion for fitness. and John (Roman) Romaniello on the left. Dan is one the most INSANE, yet genuine, guys I’ve ever met. Just spending 5 minutes with Dan is like getting an all-natural shot of caffeine. And he doesn’t just “talk the talk”. The Dude is 40 years old, ripped and his new training method is now getting a ton of national attention. 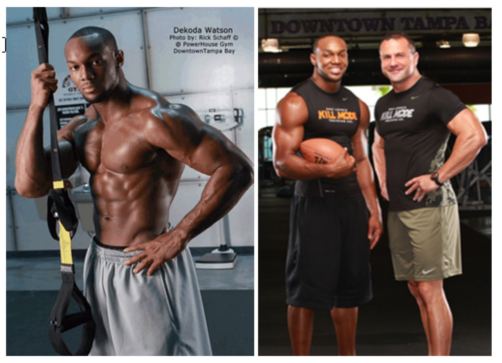 Dan has even used this new revolutionary approach to help Dekoda Watson (linebacker for the Tampa Bay Bucks) to stay lean and shredded, explode his athleticism, and stay injury free. How would you like to create the “look” you see here??? As you can clearly see, this type of training WORKS. So “why” is this type of training work so well? Because it works all the muscles on your body that have NEVER been worked. So when you apply this unique stimulus on your body, it will have NO CHOICE but to burn more fat to recover. And believe it or not it’s during the recovery phase where the fat is burned and you’ll achieve the faster results. You’ll transform your body by using a new and constant stimulus that forces your body to use new muscles groups in ways you’ve never used before. This type of training creates microscopic muscle tears, which induces thermogenesis – the action of burning more fat at rest. And now the time has come for you to learn exactly how to apply this new cure for boring workouts. So if you’re tired and bored of the same old training then I have some amazing news for you. You know, those crazy looking straps hanging all over your local gym or health club? 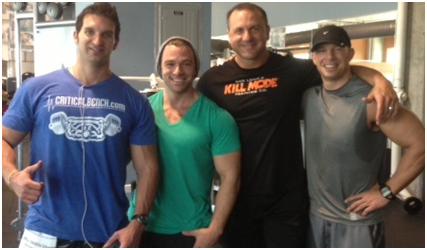 I’ve personally been trained by Dan a few times down in Tampa and his training is simply off the hook…. You’ll obviously have to “do the work”, but if you’re willing to bring your best I promise you won’t be disappointed. Head over to Dan’s website and watch his short video trailer on the top of the page and you’ll see why everybody is getting “hooked” on this new type of training. Then get ready for a new jolt of high energy training and some awesome new results. Hi where would you be able to purchase a suspention band or is it included when you purchase the workouts? Hi Ellie, no the band does not come with the purchase. I would suggest online, sports stores, etc.